Won't you join me for some Buffalo Chicken Pasta Salad today out by my waterfall? It's finally sunny here in Texas, after so much rain, and it's nice to enjoy the sunshine. I love the old fashioned look of peonies that I remember so well from my aunt's garden in Pennsylvania, with the rows of pretty peonies. I also remember how much the crawling ants liked them, too! My peonies had to be purchased from Trader Joe's, as I've never seen any grown here in Texas. I'm using the trio set that is one of six that my late Great Aunt Kitty painted for me. The pretty flowers are the same color as my store-bought peonies. The inspiration for this dish came from www.Allrecipes.com, but my adapted version uses feta cheese and ranch dressing in place of the blue cheese dressing. I also used more dressing because I don't like a dry pasta salad. Here's my version, if you'd like to give it a try. It makes for a great summer salad. Fill a large pot with lightly salted water and bring to a rolling boil over high heat. Once the water is boiling, stir in the pasta, and return to a boil. Cook uncovered, stirring occasionally, until the pasta has cooked through, but is still firm to the bite, about 8 minutes. Drain well in a colander set in the sink. Stir together the ranch dressing, buffalo wing sauce, and pepper in a large bowl. Add the chicken, bell pepper, red onion, cooked pasta, and feta cheese, and toss to coat with the dressing. Cover and chill at least 1 hour in the refrigerator before serving. I sprinkled a little parsley on top for color, and extra feta cheese. I have peony envy Kitty, those are gorgeous! What a great idea to kick up pasta salad with buffalo sauce- so glad the sun has finally come out, you've had some rough weather to say the least! Hi Kitty and thank you for another great recipe presented in a beautiful setting. This sounds so good and I will be trying it too. Love your gorgeous trio set. So summery and the prettiest painting. Peonies are a favorite here but I have never been able to grow them in my garden. Just too hot in Texas. My mother grew the loveliest peonies and I remember the ants loving them too. Your painted dishes are so beautiful, how wonderful that you have them. The pasta salad would be a nice lunch item for a father's day celebration. Yummy looking salad, Kitty! 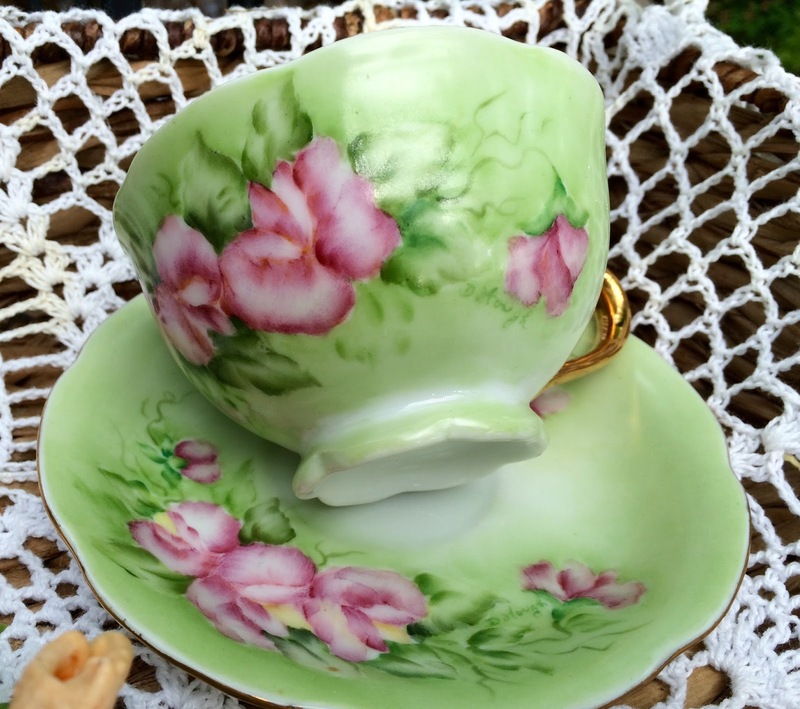 I love seeing your Aunt Kitty's hand painted china and yes, it does look beautiful with your peonies. I would love to have a Trader Joe's here. It sounds like they carry all kinds of great products, including tea. Thank you for sharing and have a lovely week, my friend. Your salad looks scrumptious, Kitty. I have peonies growing in my front garden and every spring, I wage a battle against the ants crawling on my front porch. I've tried to repel them with vinegar, lemon, paprika pepper, and baby powder but none of these worked. Ants 4, Margie 0. Yum! I wish I had some of this salad right now! Just trying to figure out what's for dinner. :) I love all things with the Buffalo flavor so will definitely try this. The peonies are gorgeous! I just love them, alas, too hot in Texas for them...and for me too! :) So happy to have sunshine...just wish our temps would not increase. Have a wonderful week my friend! What? No peonies in TX?? This recipe sounds luscious! 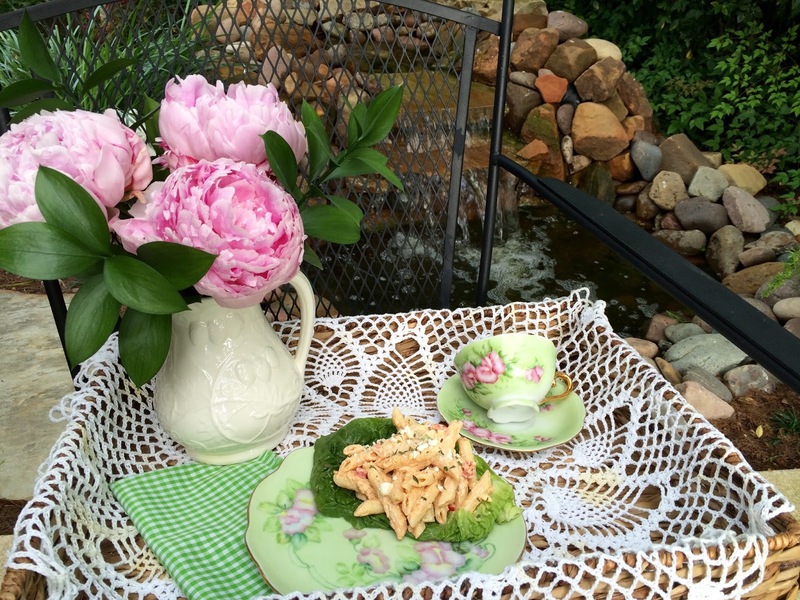 Such a pretty tea tray with the peonies by the waterfall. Peonies need a dormant period like we have over winter but at least you can purchase some for a vase. I just started cutting a few myself and the fragrance is wonderful. Thank you for the recipe. I hope to make it soon! YUM! I have a few peony plants. At least you can buy some to enjoy. Love Trader Joes. Those peonies are on your tray certainly caught my eye! I've been interested in planting a bush in my backyard but not sure we have the right soil or climate. Like you, I've been buying them at Trader Joes and they have been really lovely. Great pasta salad recipe. I think this would be a nice side dish for a bbq or a main dish on a hot summer night. I can't get enough feta cheese. I'd be happy to join, this looks delicious and I LOVE a garden party. I would dearly love to join you for a little Buffalo Chicken Pasta Salad and a lovely cup of tea from that pretty cup, but alas, 'tis just a little too far. Love those beautiful pink Peonies. Spring is certainly busting out all over in your neck of the woods. Oh Kitty, the tea cup and saucer are so beautiful. I love those colors. The peonies are perfect with that set. Chicken salad looks delicious and it's perfect timing because I'm on the lookout for some new salad recipes for summer. Have a great week! Absolutely gorgeous - and your auntie was quite the artist - that is amazing gorgeous china, Kitty! Hi Kitty, I'm so glad that the weather is better for you. I do hope it did not affect you in any way. This pasta salad looks so good. I love the pretty tea cup and flowers. Thanks for sharing this at Cooking and Crafting with J&J. Enjoy the week. Great looking pasta salad! Beautiful peonies. If only I had a Trader Joe's!!! No peonies on sale anywhere in Alabama that I know of. Now, that is a shame. We would buy them!!!! You are so blessed your "Aunt Kitty" left you beautiful china painted teacups. I know she was special. I love your painted dishes! I thought they were "lefton" when I first saw them! Oh, I adore peonies. They are my favorite flower. My mom once told me that the ants are good for them. Not sure if that is true, but it's what she said, and I've never forgotten that. Your painted teacup is beautiful. I love the pink and green combination. Were you named after great Aunt Kitty? The pasta salad looks yummy. I am going to pin the recipe. I will probably have to alter the amount of hot sauce. A few weeks ago, I made a buffalo chicken salad, and it was WAY too spicy for me to enjoy. I love the hand painted teacup! So glad you were able to enjoy the outdoors again. I would have made the same recipe changes...I don't like blue cheese and love Ranch. Looks like summer to me! Thanks for linking to Tuesday Cuppa Tea! Kitty this sounds so delicious! Don't you just love using rotisserie chicken for recipes? It makes it all so easy! I don't think I have met a pasta salad that I didn't like! Sounds so good. Peonies are my fave flower. I grew them in Brooklyn, but the ants made me crazy. How PRETTY, Kitty! You've combined the flowers & the colors of the hand painted items so beautifully. So blessed to have such treasures! That pasta salad looks scrumptious, too. Strangely, I don't get a single ant on my peonies. I remember them well from childhood & these are cuttings from those same plants. I think it might be due to the stuff the landscapers put on all the lawns here to combat grubs & such. Whatever, I'm thrilled to be able to bring them inside & not have to worry about bugs! Kitty! Your aunt is so talented. The teacup and saucer are gorgeous! 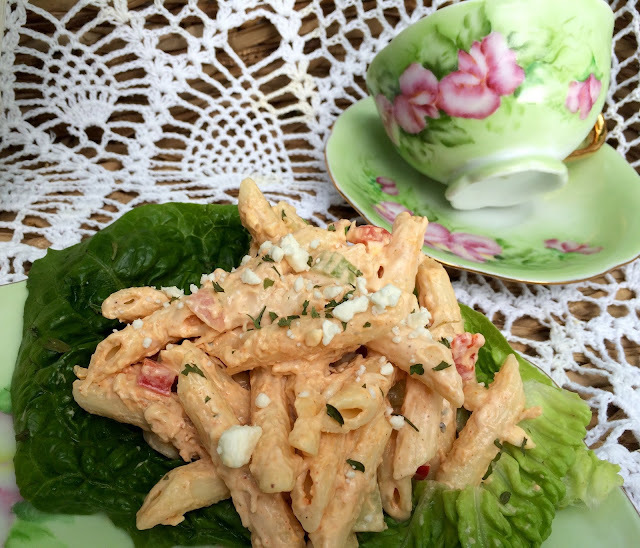 The buffalo chicken pasta salad will make a perfect summer lunch or supper. Thank you for sharing your special tea party lunch with us! Your salad looks wonderful Kitty. I have company this week so I am late responding with comments. Glad you rain came to a halt finally. I love your Aunt's trio she painted. Thanks for sharing and linking. I have been wanting to try buffalo chicken salad and your recipe looks out of this world. I have pinned this as well and can't wait to give it a try! Perfect for our Texas Summers too. Happy Thoughts of Home. I'm sharing this on Poofing the Pillows Facebook page. Kitty, that sounds wonderful! Please set a place for me at the table by the waterfall! Oh my, oh yummy! I pinned this recipe just from reading the title of your post! The ingredients sound wonderful. Thanks for sharing it. It is perfect for a hot summer supper! My men love buffalo chicken and I can't wait to try this! I have two peony bushes I planted earlier this year and so far they are doing very well. It generally takes a year or two before they bloom. I'll keep you posted. Thank you for so faithfully joining us at Thoughts of Home on Thursday. You are a treasured blogging friend. This looks wonderful I love pasta, especially in the summer. Was so nice to meet you the other day at the retreat. Looks like you have some wonderful recipes here, I'm going to have to dive in. Hi Kitty, your tea time looks so inviting! I love your aunties tea china, what a beautiful talent! I will be making your recipe soon for my grandsons. I know they will love it! Thank you so much for sharing! Oh this salad sounds delicious Kitty! Love Peonies. These are very similar to two of mine in my garden. They were gorgeous last week. I didn't get any cut to bring in and now they are just about done. :( Wished they lasted longer! Love your beautiful teacup set too! Thanks for sharing with SYC. Your Peonies are just beautiful and provide a perfect setting for your Buffalo Chicken Pasta Salad, we will love this recipe! Thanks so much for sharing with Full Plate Thursday and come back to see us real soon! Looks delicious Kitty! I have the ingredients too. Your tea cup and saucer is gorgeous!